You love each other. You love our planet. More couples are combining the two. If you’re here, you want to make a difference in your corner of the world. This post isn’t designed to make you feel guilty. Quite the opposite. This wee guide is packed full realistic suggestions for making your wedding eco-friendly. Pick and choose what suits you and your personal circumstances. The most important take away from this post is that sustainability can be at the heart and center of your wedding planning and design. It’s an entirely achievable aim. Planning and designing an eco-consious wedding is easier than ever thanks to couples like you who care about our planet as well as passionate independent businesses who are deeply committed to helping you reduce the carbon footprint of your day. There’s a swathe of Scottish suppliers referenced in this post who’re running their businesses with sustainability at the heart of their business practice. Some of these tips may even help you to save money. 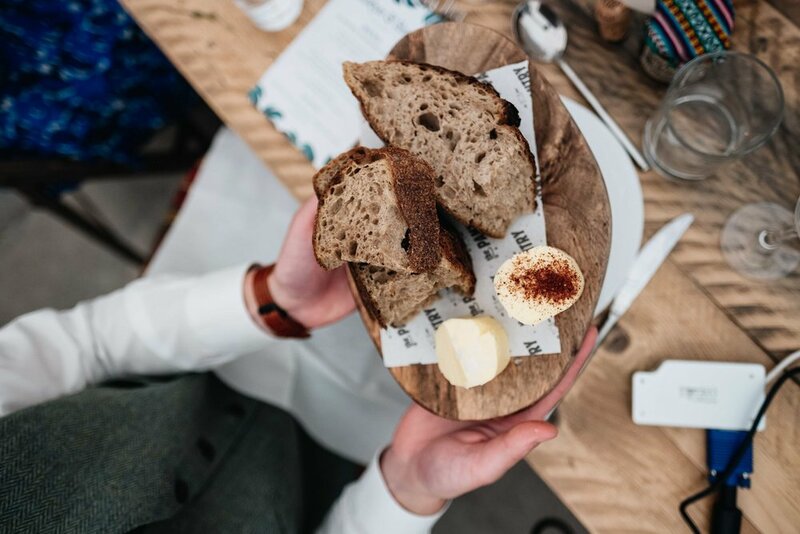 Scotland has some incredible caterers who use locally sourced ingredients to create phenomenal dishes. Family style sharing platters and buffets style meals are a lot more fun than the traditional sit-down meal approach. There’s the added bonus of less waste involved in these kind of meals. Not only does a locally-driven, sustainably sourced menu usually mean much higher quality ingredients, it also cuts down on the carbon footprint associated with the travel involved in bringing non-local ingredients to your tables. Many people are consciously choosing to reduce their meat consumption. Opting to have a vegetarian menu for your wedding day will thank you for this. It goes without saying that you need to be clear to your caterer that you want to avoid single use plastic and that drinkware and serveware should be reusable. Family style meal by The Pantry. Again, go seasonal, go local. There are a number of ethical issues associated with flowers coming in from overseas. Most often, environmentally damaging fertilisers will have been used on them. There’s also air miles associated with transporting them to Scotland. There are many environmentally kinder ways of incorporating flowers into your wedding day. To start with, there’s many talented florists who are putting environmental well-being at the heart of their floristry businesses. You can chat with them about how your flowers can be reused throughout the day. Perhaps the bridal bouquets could be used as part of the table styling once the official photographs have been taken, if you’re having those. Your florist will have any number of creative ways you can recycle your flowers throughout the wedding day, and beyond. Curve ball. You could use faux flowers as an alternative to real flowers and Lisa Gaston who runs Floral Renegade is leading the way in Scotland in this regard. Venue decor can be fun and look incredible. Is it always strictly necessary for creating a beautiful space? To answer this, take a step back and ask yourself what your space really needs. Sometimes beautiful spaces exist as they are and don’t need anything extra. The stress involved in staying up for several nights DIYing venue decorations can be exhausting and oftentimes, needless. Remember, you’re marrying in Scotland where incredible nature and character-filled cities are in abundance. Lean on these aspects of our wonderful country. Quite often they stand out more than any decorative detail. Of course, there are blank canvas venues which will require you to create your own space. Crowdsource. Set up a wedding Facebook group specifically to help you source key items needed for your day. Better still, get the pros involved. Check out Brolly Bucket who specialise in hiring umbrellas, blankets, cushions and baskets. I’m a wedding photographer so my whole business relies on couples booking me because they want something tangible to remember their day by. The same principle extends to stationery. It’s great to have physical memories of your wedding and your stationery is something you’ll keep for years to come. The benefit of working with a small Scottish company like Skinny Malink or Origami Fox is that they’ll really listen to you and work alongside you ensure your stationery fits with your values. Firstly, find a designer who offers recycled or sustainable materials. Using seed paper, cotton or bamboo invitations printed with soy ink are kinder on the environment. You can also include a small note on the invitations themselves, encouraging guests to recycle them rather than toss them in the bin after the event. Go paperless for the save-the-dates. 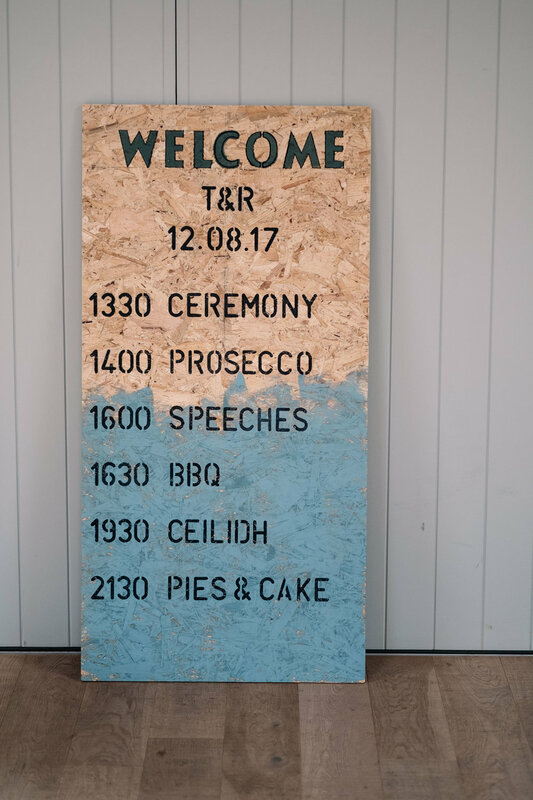 Instead of issuing individual bits of paper with the menu, order of service and plan for the day commission a calligrapher to write on a big blackboard or wooden panel. Bonus of this is that it’s another tangible mementos of your wedding day. The good news is that sustainability is driving many outstanding UK based jewellery makers. More and more small independent jewellers are putting sustainability at the core of its practice. Consider the materials used to make any jewellery you intend to buy. If gold’s your thing, alluvial gold is found through the process of extracting from creaks, rivers and streams. It’s generally considered to be the most environmentally friendly method of gold mining as a result of the reduced environmental impact when compared to underground mining. Another biggie is to incorporate ethically sourced traceable gemstones. Then there’s the non-traditional option of eco wood rings which are crafted from salvaged and sustainably sourced materials. A favourite of mine are Wiltshire based duo Laure + Steve who make eco wood rings. There are a few different ways to approach ethical bridal and groomswear fashion, including buying a vintage or second-hand outfit and recycling your dress after you wear them. Perhaps one of the most impactful option is to support designers who work hard to ensure fair conditions for their garment workers and source fabrics from suppliers who do the same. For grooms and bridal party, consider choosing outfits that can be worn again. Involve them in the decision making process. If you’re having a squad, have them wear something that flatters their body shape and colouring. They’ll love you for this and more likely to wear it again. Check out my pal over at Gung Ho for ethical, alternative bridesmaids dresses. Of course, renting is a great way of reducing cost and waste. Then there’s ‘Wish for a Wedding’ which is a charity that supports couples dealing with a terminal illness who want to plan a wedding. One way they support their couples is by accepting wedding dress donations. Is there really a better way to re-use your wedding dress? Any dresses donated that aren’t used after 12 months or aren’t up to the standard required to be reused will be turned into rural gowns for babies who are no longer with us. Why fly a photographer from another continent when there’s an abundance of local talent in the country you’re marrying? It’ll end up costing you more and you might be missing out on someone outstanding who lives closer to your wedding location. They’ll be more familiar with local customs, hidden spots to go to for incredible photos as well as being comfortable with weather and light patterns. Scotland’s weather is highly unpredictable and so Scottish wedding photographers will have the right kit and mindset for the unexpected. Search Instagram using the relevant hashtags to help locate someone whose style and approach you love. Check the location of any photographer you’re considering. Whilst the #scottishweddingphotographer has been used don’t assume they’re based there. Many photographers use it as a way of securing that destination wedding they’re desperate to shoot. Wedding favours are a way of saying thank you to your guests; a small token of your appreciation for their sharing in your special day. Traditionally guests would receive a small bag or box containing 5 sugared almonds representing the five blessings of health, wealth, happiness, long life and fertility. Avoid giving unnecessary favours which will end up as waste. It will save you money too. Your guests know you’re delighted to have them there by virtue of them being with you! That said, you may want to give a small gift. We did. We opted for friendships bracelets made by street children we volunteered with at Vinetrust when in Peru the year prior to our wedding. Vinetrust helped us to organise this and we were delighted to support a charity who meant a lot to us into our wedding day. We explained to our guests the story behind them. Likewise, you could support a small independent Scottish brand such a Bare Bones Chocolate who source their beans from co-operative farms in Madagascar and Honduras. Their chocolate is exceptional and I’m now including their handcrafted chocolate in my welcome packs for couples who book with me. What about giving a candle by Glasgow based Neatly Wrapped? Their soy wax woodwork candles are organic and recyclable with plastic-free packaging. Most importantly, theysmell beeeeeyond wonderful. They’re another small brand I support in my business, often sending their candles to my clients. Great news. Eco-friendly and cruelty-free make up brands are on the rise with some of Scotland’s most talented wedding make up artists incorporating ethically sounds brands into their approach. Book a make up artist who is actively working towards using these kinds of products. Confetti is incredible. Everyone loves it and it makes for fun, energetic photographs. As a photographer, it’s one of my all-time favourite moments on the wedding day. In fact, I love it so much that I’ve written a post called Why You Need Confetti on Your Wedding Day. Just be sure to use biodegradable confetti. Struggling to source this. Make your fist stop Shropshire Petals. They supply biodegradable delphinium + wildflower petals which are handpicked + handpacked on their Shropshire Farm. Go a step further + reduce your carbon footprint by avoiding confetti cones which are discarded after a single use. Use wicker baskets instead. Guests can take a generous handful before taking their best confetti throwing position! This is particularly helpful if you’re eloping to an area or country you’re unfamiliar with. Working with a planning specialist can help ensure you source suppliers who share your approach to your wedding day. Working with a planner will help save you time because they can have the initial conversation with suppliers to establish whether they’re aligned with your values before presenting a short list to you for consideration. Working with a planner who knows the industry will help save you time when trying to source ethical suppliers. Make a plan for post-wedding giving. Waste will feature in wedding regardless of how sustainably focused your mindset is in the planning and design stage. Chin up. There’s a bunch of different ways you can reduce the potential waste. Firstly, donate your leftovers – and not just food – to help others. Designate your bridal party to give your flowers to the local nursing home or hospital. Alternatively, they could distribute them around bus stops, cash machines, coffee shops with a short note explaining they’re wedding flowers looking for a new home. If they aren’t salvageable, make them into compost. As for the left over food, put your bridal party to work again. Find a homeless shelter, church or a food bank willing to take your leftover meals. For example, Perth Gospel Hall has a weekly homeless outreach you could donate food to. If these options don’t work for you, you can also set out compost bins for the remaining leftovers. A massive thanks again to the following Scottish wedding suppliers who took the time to contribute to this post. These wonderful folks are passionate about our environment as well as supporting you achieve a more eco-friendly day. It goes without saying that there’s many, many more wonderful small indy businesses who have sustainability at the heart of their business practice. For a start, check out Braw Brides and The Wedding Collective. They’ve curated the best businesses in the Scottish wedding industry and you’ll find them friendly as well as exceptionally caring.